Milan: Arnoldo Mondadori Editore, 1990. 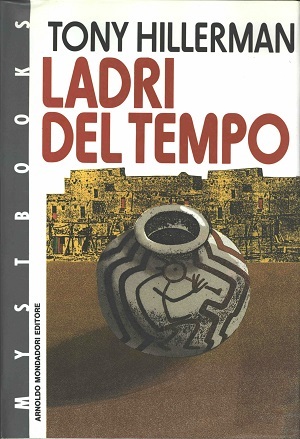 This is the first Italian paperback edition of A Thief of Time. It was published in Milan, Italy by Arnoldo Mondadori Editore in 1990. Tony Hillerman's original text in English was translated into Italian by A.M. Francavilla. The cover was illustrated by Prieto Muriana and designed by Staff Milano. The cover draws a feature from Peter Thorpe's original cover for the first edition, a black-on-white ceramic vessel with Kokopelli. This image has been sampled for most of the covers of the various foreign language editions of A Thief of Time. This edition also has a front and back cover fold-out. The front fold-out contains a brief synopsis and the back cover fold-out contains a picture of Tony and a short biography of him as a writer. Format: Paperback, 22.5 x 15.5 cm. Binding: Full-colored paper covers with front and back foldouts. The author, title, and publisher's logo are printed in white vertically on the spine.